Rich and creamy Sausage and Pumpkin Pasta made with ground sausage, pumpkin puree, garlic, sage, and lots of Parmesan cheese – comfort food at its best. Pumpkin puree in savory dishes is one of my all-time favorite ways to use the stuff! I feel like we think pumpkin recipes and we go straight to those yummy pumpkin cookies and pumpkin bread. I’m here to convert you to pumpkin in every dish, all day long, including dinner! Pumpkin puree is magical if you ask me. It’s nutritious, inexpensive, easy to find, and easy to use. It adds beautiful color, a subtle sweetness, and a rich creaminess to dishes. 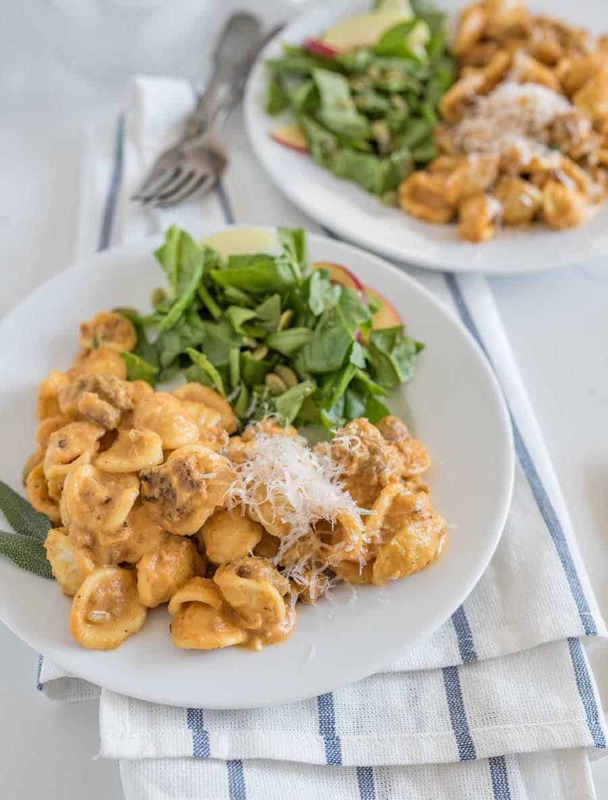 One of my favorite ways to use pumpkin is with pasta! 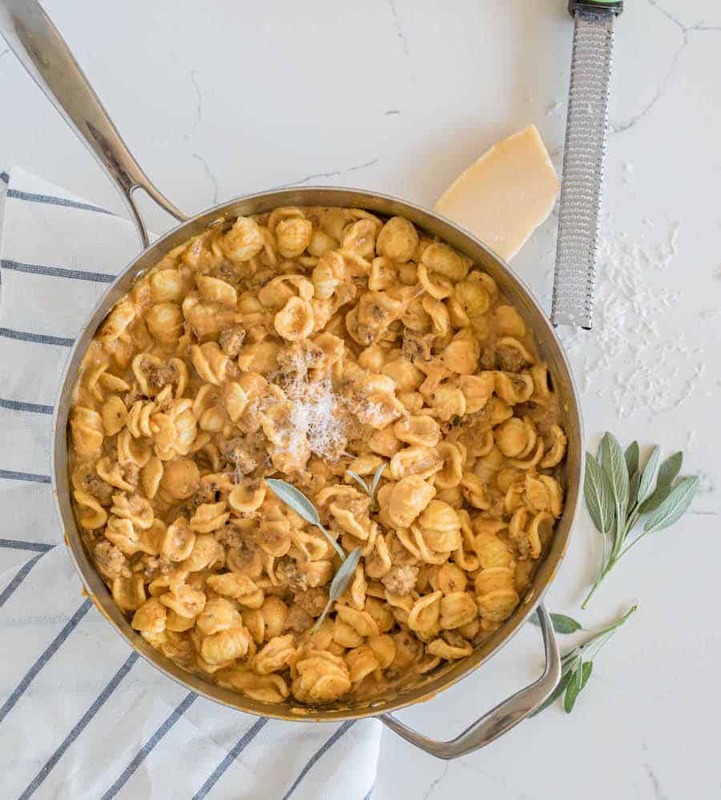 When the dish is made, the pasta looks super cheesy and tastes extra rich. But the secret is the pumpkin puree. 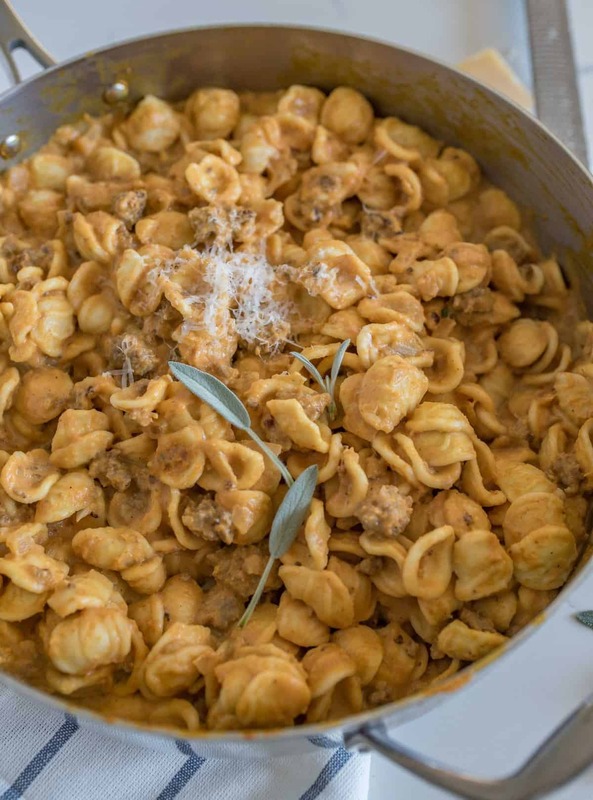 Sausage and Pumpkin Pasta is one of my favorite dishes to make for company, because pumpkin is such a surprising ingredient. 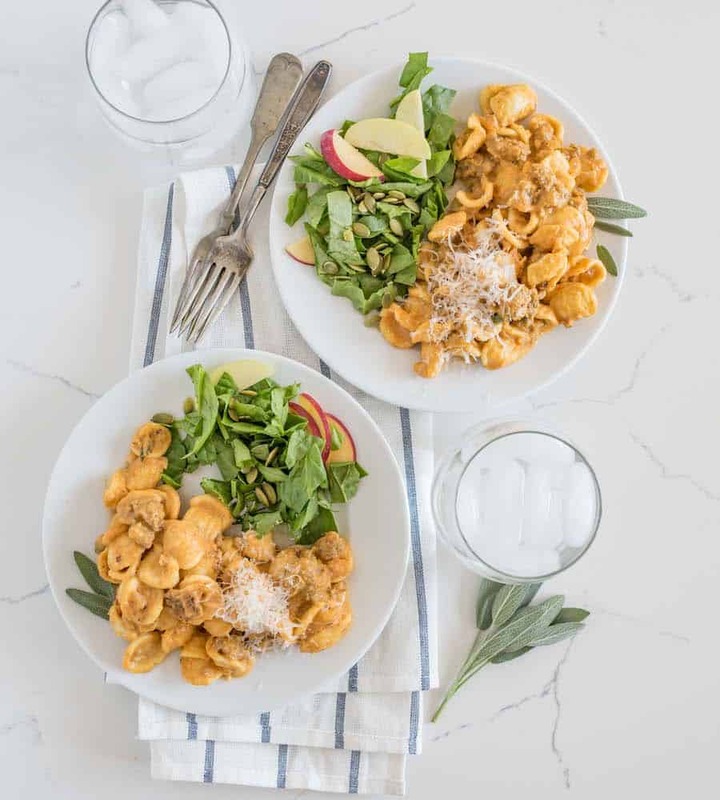 The sausage, sage, and just a bit of cream and Parmesan make this pasta dish a favorite without much work on your end. I can’t wait for you to try it. This pumpkin recipe is part of pumpkin week! A week that I dedicate on the blog to all things pumpkin – sweet and savory alike. I’ve done this every year for a few years now and I enjoy it so much. I hope it inspires you to get in the kitchen and gives you a few more ideas on how to use pumpkin besides the classic pumpkin cookies. I like sage but I don’t love it, so I added 2 leaves. If you know you love it, add the full 4. If you are somewhere in the middle, try three. You have a lot of freedom when it comes to what sausage you use. You can use hot Italian, sweet Italian, pork breakfast sausage, and just about anything in between. Just be sure it’s a ground sausage and remove any casing before cooking. 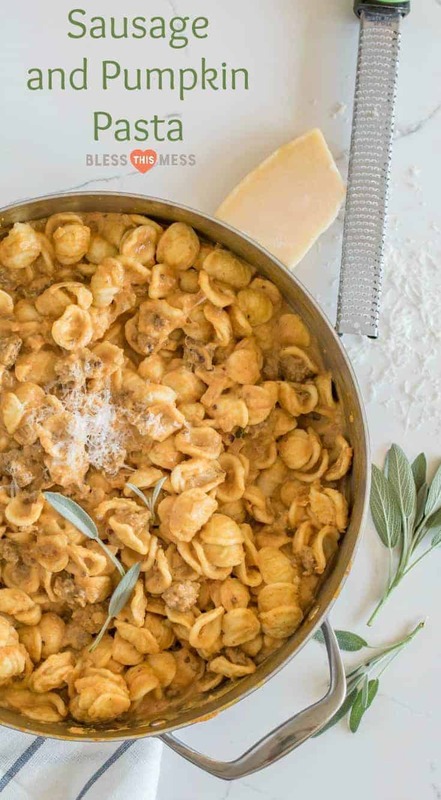 I like to use a sturdy pasta like Orecchiette, Rigatoni, or even Bow-Tie. Chubby big pasta pieces work well with the ground sausage. To speed up the cooking time, you can cook the pasta in a separate pan and start making the sauce in a second pan while the pasta cooks. You can save on time or dishes, but not both. 🙂 I love this saute pan if you are in the market. 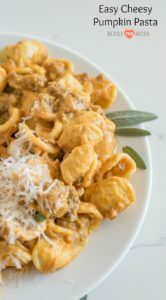 Rich and creamy Sausage and Pumpkin Pasta made with ground sausage, pumpkin puree, garlic, and lots of Parmesan cheese – comfort food at its best. Cook the pasta in a large saute pan according to package directions. Drain, reserving 1 cup of the pasta cooking water, and set aside. In the same pan, add the sausage and cook over medium high heat for 3-5 minutes. Add the onion and cook for an additional 5 minutes, until the sausage is no longer pink and the onion is translucent. Add the garlic and minced sage and cook just until fragrant, about 30 seconds. Add the chicken broth and cook until the onion is tender, about 3 minutes. Stir in the pumpkin and cream and reduce the heat to medium-low. Stir in the Parmesan cheese. Add the cooked pasta to the pan and stir to coat it well with sauce. If the sauce is too thick, add a small amount of the pasta cooking water to thin the sauce. The sauce should coat the pasta easily. When the pasta is hot, remove the pan from the heat. Serve the pasta hot with additional salt, pepper, and Parmesan to taste. You have a lot of freedom when it comes to what sausage to use. You can use hot Italian, sweet Italian, pork breakfast sausage, and just about anything in between. Just be sure it’s a ground sausage and remove any casing before cooking. 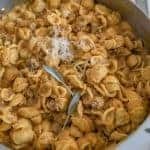 I like to use a sturdy pasta like Orecchiette, Rigatoni, or even Bow-Tie. I have so many pumpkin recipes on my site (SO MANY!). If you are looking for more inspiration, just search “pumpkin” in the task bar at the top of the page. 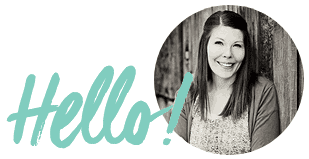 Sweet, savory, healthy, or dessert, I have you covered! Enjoy this recipe and all the deliciousness that pumpkin season has to offer from my kitchen to yours. Made this tonight. Wow! As a lifelong pumpkin dessert hater, I was looking for a way to incorporate this amazing food into my life. I used some leftover cheese sauce instead of cream, tho, and it was a bit too rich, but delicious nonetheless. 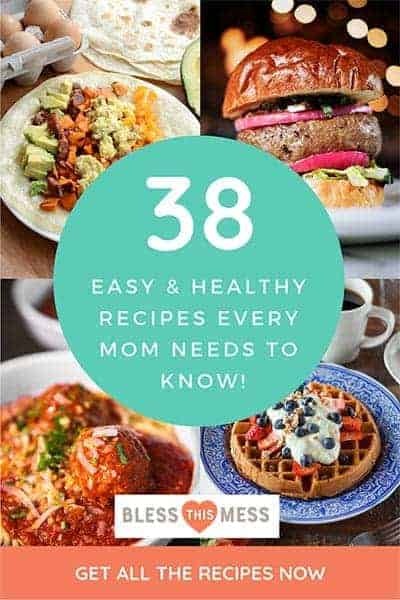 I look forward to tryng the rest of you recipes! I’m so glad that you liked it and that you are working more pumpkin into your life, it’s so good isn’t it!